With the founding of the Equal Suffrage League (ESL) of Virginia in 1909, women in the commonwealth began lobbying for the right to vote. Lila Meade Valentine, as the first president of the league, traveled throughout the state to raise public awareness and build support for women’s suffrage. Other prominent participants included authors Ellen Glasgow and Mary Johnston, education activist Mary Munford, and artists Nora Houston and Adèle Clark. The ESL members worked tirelessly for a decade, but they failed in their efforts to convince state representatives that women should have the vote. 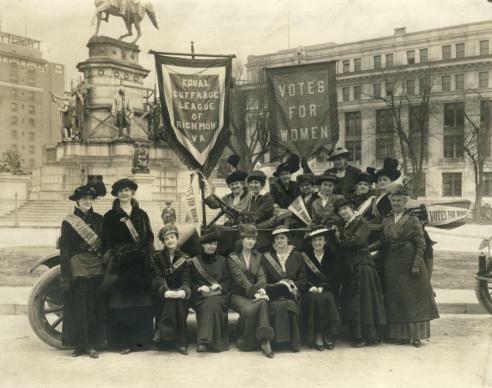 Other southern states, including Alabama, Georgia, Mississippi, and South Carolina, also fought to keep women away from the polls. One foil to passage was the issue of race—some members supported suffrage for all women, while others favored suffrage for only white women. Another stumbling block for woman’s suffrage was its close tie to the labor movement and the call for legislation to protect women and children from the exploitation of sweatshops. All of ESL’s efforts were complicated by Virginia’s one-party rule, which made exploiting differences between political parties impossible. After years of defeat at the state level, the ESL switched tactics and focused on winning Congressional passage of the amendment. Women in Virginia gained the right to vote in 1920 with the passage of the Nineteenth Amendment to the U.S. Constitution. It passed without Virginia’s support, and in 1952 the General Assembly officially adopted the amendment. Learn about letterhead in correspondence.